Send Me This Wagon (inside) gets nosed out by fastest qualifier Ellen Regard on the first night of trials to the Remington Park Futurity. 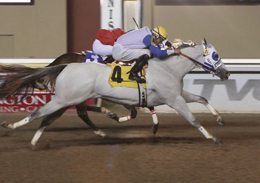 OKLAHOMA CITY, OK�APRIL 6, 2013�Send Me This Wagon, a filly by PYC PAINT YOUR WAGON, sired qualified to the rich $720,000 Remington Park Futurity on the first night of trials Friday. The final will be run on Saturday, April 20. Owned by Lesseed by Jana Harrison, Stacy and Rnady Hill and trained by Stacy Charette-Hill, Send Me This Wagon was ridden by G.R. Carter, Jr. The filly finished second by a head in the fastest trial on Friday, crossing the 330-yard finish in :16.914 seconds over the fast track. She posted the second fastest time from night one. Michael Pohl bred the first time starter from the Mr Jess Perry mare Jess Send Candy. The nation's #1 Leading Sire of Money Earners' PYC PAINT YOUR WAGON also sired four of the 10 preferred invites for the $100,000-Guaranteed Remington Park Juvenile, to be run on Sunday, April 21. Little Pyc and Painted Laico Bird both won their trial races with Jess Send Me Candy and Wagon Tales finishing close seconds. All four horses were in the second 10 fastest qualifiers from the two nights of racing.